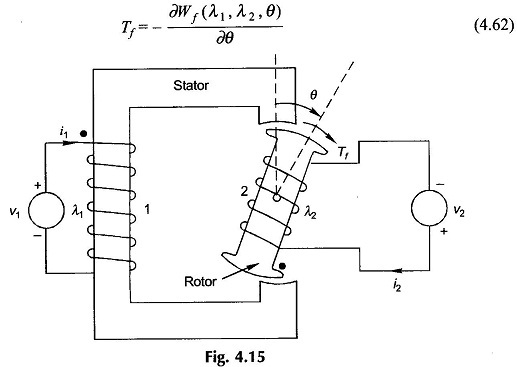 Multiply Excited Magnetic Field Systems – Singly-excited devices discussed earlier, are generally employed for motion through a limited distance or rotation through a prescribed angle. Electro-mechanical transducers have the special requirement of producing an electrical signal proportional to forces or velocities or producing force proportional to electrical signal (current or voltage). Such transducers require two excitations one excitation establishes a magnetic field of specified strength while the other excitation produces the desired signal (electrical or mechanical). Also continuous energy conversion devices motors and generators require multiple excitation. One continuous energy conversion device has already been studied in Ex. 4.6 which is singly-excited (reluctance motor). (c) The average torque is zero and changes sign at 0 = 0°, 90°, 180°. 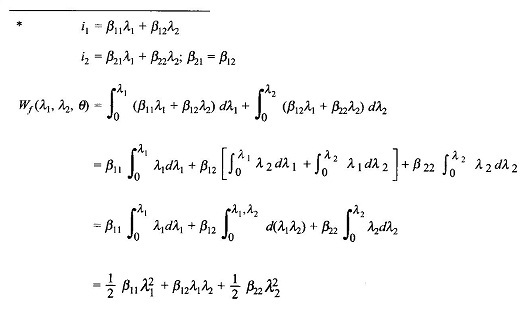 The rotor can come to rest at any of these values of 0 but the position of stable equilib­rium will only be 0 = 90°, 270°, … (The reader should draw Tf(av) versus 0 and reason out).